Brother and sister reunited after 47 years, 1951. Caption slip reads: "Photographer: Glickman. Date: 1951-10-04. Reporter: Glickman. Assignment: Oscar Kallgren and sister Mrs. Anna Axelson reunited after 47 years. (no candles). 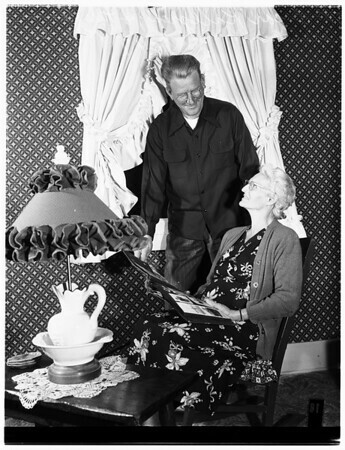 Oscar Kallgren and his sister, Mrs. Anna Axelson look over a family album trying to recall their childhood together. Ignoring the worlds series on television, Kallgren and his sister Axelson gaze at each other".